How on Earth do you keep it going? What’s the difference between ending a story and just stopping it? Regardless of genre, length, or form, every story has a beginning, middle, and an ending—in no particular order. Beginning writers often start their stories in the wrong place, confuse action with plot, and then end a scene a bit too early… or too late. 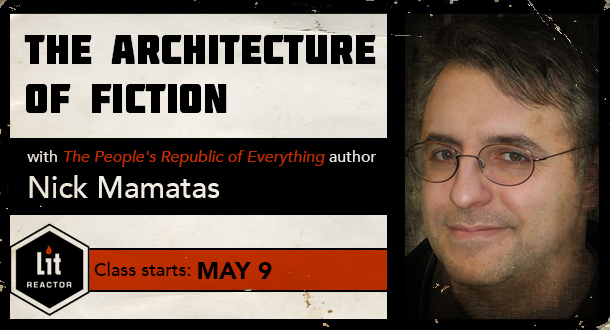 In four weeks, award-winning novelist, anthologist, and editor Nick Mamatas will guide you up and down the path of storytelling—through the architecture of fiction. Nick acquires novels and short fiction, and knows what agents and editors are looking for in today’s marketplace. His work is acclaimed by critics, and praise from outfits like Publishers Weekly and Booklist prove he knows how to keep a reader engaged. This workshop will give you the tools you need to move through a story with confidence—whether it's a novel, novella, or short story. Week 1 Lecture: Where Do I Begin? Starting the story as close to the end as possible. Watch out for the “hook”—and how to keep good advice from turning bad. Selecting the correct point of view. Conflict, jeopardy, and revelation—the keys to plot. Starting with effects, ending with causes. The ol’ try-fail try-succeed routine. “Wrapping up loose ends” vs “Un-knotting”—what is a denouement? Writing with a ragged edge. Writing a story worth re-reading. Week 4: All Together Now! Each week of the class will include a homework assignment to demonstrate the skills you learn—and it'll be critiqued by both Nick and your fellow classmates. There will also be ample opportunities to pose questions to Nick, engage in discussions, and explore topics related to the class, and to writing. Leave with a deeper understanding of story structure—an understanding that demystifies it for you, while leaving it mysterious for your readers. Develop an understanding of what editors and agents look for in the first chapter, or on the first page, of a submitted manuscript, and what makes them reject stories right away. Understand how to synopsize a novel for submission.